Just got back from a Spring Break trip to the Grand Canyon. It was an awesome trip! One area of angst was the early morning light streaming thru the shower skylight. 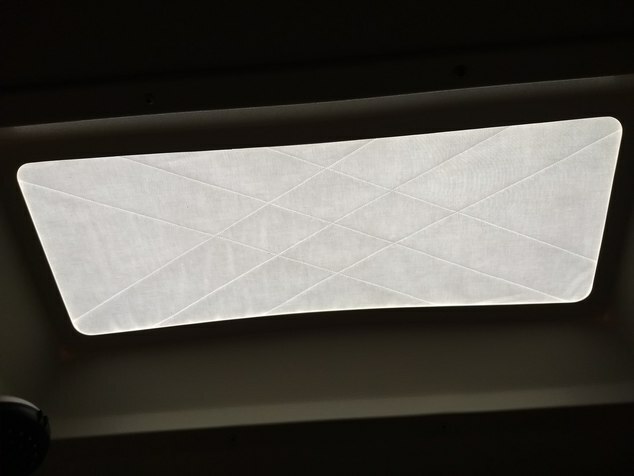 The inside walls on this skylight are sloped, so a vent pillow doesn't stay up there. Has anyone figured out a way to install some sort of shade on this skylight? We tried taping a garbage bag up there, but it didn't work very well and looked terrible. BTW, we have a 2007 Cougar 5th Wheel. One summer I took some reflective foil and put it on the inside. My skylight is two halves an inside and outside. I unscrewed the inside and layered the bubble foil in between. I've heard warnings that this could cause the skylight to crack due to heat reflection but I didn't have an issue, doesn't get extremely hot where we summer and it sure blocked the light coming in. That's a great idea Ray! Thanks!! We had our roof covered with rvroof.com and they asked about spraying the skylight. I was happy to have it done. I used aluminized mylar bubble wrap held up on the inside by three small screws with 1/2-inch long nylon bushings along each side. I stopped using it after the paint along the edges of the skylight showed signs of cracking. It seems that the reflective bubble wrap made an oven up in the top of the skylight. I took some white fabric and batting and quilted the batting between 2 pieces of the white fabric. I just 'quilted' diagonal lines so it's nothing fancy. You could use a darker fabric if you wanted to eliminate any light. My husband look the bottom part of the skylight down and put the fabric up then screwed the skylight frame back on. The white gives a diffused light. My husband just reminded me he did a YouTube video on it. Search for RoVing Walkers. We cut some Reflectix bubble pack insulation to size and stuck it up with Command strips. It works great and you can easily take it down if you want to see the sky on a particularly cloudy day! We live and camp in Middle Tennessee which is plenty hot and sunny and have not had a problem with any bubbling or cracking of our skylight. It makes a huge difference in the heat factor inside the camper as well as keeping out the early morning light if we want to sleep in. We also use the Reflectix on our slide windows in the bedroom for a cozy dark night of sleep!